In a beautiful secluded south-facing hillside setting, this detached croft house has wonderful views across Loch Morar to the mountains beyond. 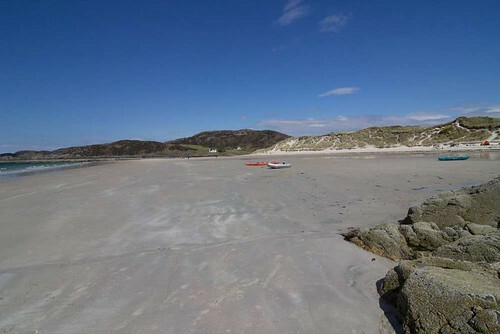 The famous 'Silver Sands of Morar' are within easy reach by car and this spectacular area is ideal for hill-walking, birdwatching, beach walks, sailing and boat trips to the Islands of Eigg, Rhum Canna and the Isle of Skye. Fishing is available by permit and there is a spectacular coastal 9-hole golf course 6 miles away. The house is spacious, cosy and comfortably furnished and has a safe, enclosed lawned front garden with picnic benches. Approx 100 yds walk from the parking area. Shops approx. 6 miles. 1 bedroom with double and single bed, 1 double and 1 single bedroom (cot available by prior arrangement); dining room with open fire, living room, kitchen, bathroom (electric shower over bath), extra separate toilet. All electric plus open fire/back boiler. Fridge/freezer, auto washer/dryer, microwave. Flat screen satellite television, video and DVD player. Bed linen and towels available for hire. "We have never stayed in a more perfect location"
What a lovely welcome. Everything we could possibly need. A house with a plug just where you look for one, a lamp in just the right corner, a hook in just the right place. We had a lovely mix of weather conditions but the view was exquisite whatever it through at us. We spent most of the evenings (April snow showers) with duvets wrapped around our shoulders on the lawn watching the moonight play on the Loch. The TV didnt work so well in cloud but that just meant we made more of this beautiful location. Cosy log fires and cycle rides down to Silver Sands along a road we met two cars on all holiday. You must try andy Race's fish shop down at Mallaig harbour - sooo cheap and superb quality. And the most fantastic butchers tucked away in the Spar up the hill too. Favourite pub had to be the Back of Keppoch Knoch na Faire an easy cycle ride from the house even for our five yr old. Thankyou and we hope we can return soon. Excellent accomodation - 2nd visit will stay again.